Mental Image: What Do You See When You Study Your Putt? mind's eye a successful outcome. The better the information you give your brain, the more likely you are to succeed. By visualising a positive outcome just before you putt, you are programming yourself for success rather than failure. For example, on the green you can imagine in vivid detail your ball tracking to the hole and then falling in. Unfortunately most golfers see only the ball and the hole without being able to picture a connecting pathway. This gives their brain very little to work with. Mental imagery is part of a process know as visualisation. This is a rehearsal technique used by elite athletes to enhance their performance. They are able to play out in their head a movie of perfect execution. Through repetition and rehearsing mentally what they want to achieve, they are preparing their body for action. For example, a diver on the high board will re-run his or her routine step-by-step moments before the dive. Jack Nicklaus famously trained his mind to visualise the ball's trajectory for each shot and how it would react when it landed. In golf, putting is an end game. There is no recovery from a missed putt - it is one more to your score. Once you have a solid stroke, the mental side to putting will ultimately determine your success on the green. What you do in the 10-second interval immediately before you stroke your putt plays a critical role in the probability of a successful outcome. Most of us are programmed to think negatively. As children we were constantly reminded of the risks we faced. So it is little wonder that as adults we often harbour the idea that something bad is going to happen. In putting there is no room for doubt or hesitation. Your mindset has to be one of total confidence that you are going to hole the putt. 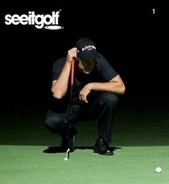 Prior to his 2009 Masters win Angel Cabrera viewed a video of all the putts he had made in capturing the 2007 US Open at Oakmont. This positive reinforcement restored the self-belief that he was a good putter and could make crucial putts. Aaron Baddeley, one of the best putters on the PGA tour, uses a strong mental routine on the green. He pictures clearly the path from ball to hole. He sees in his mind's eye the ball going into the hole. When he putts he is confident of success. This is because he has already seen the ball go in the hole. Sports psychologists tell us that what we think about just prior to an act will directly affect the success, or failure, of our effort. See your putt missing and you will probably miss it. Picture success and you have a better than even chance of attaining it. The underlying message: If you picture something often enough and vividly enough, your prediction will become your performance.